Myste Vare is located between Avachyle and Fel'aran'thir. It actually consists of 2 islands, one of which is sacred to the dragons. The island names are Myste Vare and simply the Temple of Fel'aran'thir. The Temple of Fel'aran'thir was created centuries ago by the golden dragon Rana and her twin brother Flame. (See: The Dragon Swords Series). The twin dragons arrived at the island to discover a ragged tribe of humans living there. They claimed to have always worshipped the god of dragons Fel'aran'thir and served the dragons themselves, even though the dragons had forgotten about them. Rana and Flame, with the help of a few friends, raised the Temple of Fel'aran'thir within the mountains. It has remained the same to this day. Humans still live near the Temple. A few dragons remain, though no more than a handful. Dragons will typically travel here for pilgrimages and such. 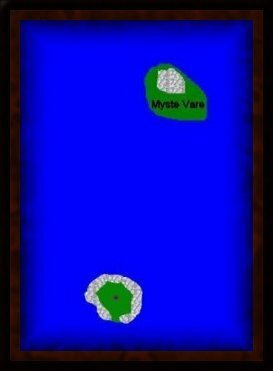 Myste Vare had, until recently, remained an abandoned island. It did not even contain any magic. The dragon Flare and a few friends traveled to Myste Vare to create a new dragon homeland that would not be filled with harsh feelings like Fel'aran'thir. Flare died while helping the King of Avachyle Gavin Haleven. His friends returned to Myste Vare with some craftsmen and engineers of Avachyle to continue the dream of Myste Vare. They built a beautiful fortress with palaces outside for the humans and elves, as well as sprawling caverns within the mountains for the dragons. In creating the land, the dragons inadvertently infused the land with magic, though fairly weak. Its powers do not compare to the lands that surround it. The people and dragons living within Myste Vare enjoy an alliance with Avachyle.